It’s very, very unlikely that hell exists. But if it does, can we rely on the Quran to figure out who’s going there and who isn’t? Well, no, we can’t. In verse 3:85 the Quran tells us that everyone who follows any other religion other than Islam is going to hell. This includes Christians and Jews. This claim is repeated in verse 5:72. But the Quran also tells us in verse 2:62 that all believing Christians, Jews, and Sabeans will go to heaven. This claim is repeated in verse 5:69. I haven’t read any apologist responses to this contradiction. If you’re familiar with any, feel free to post them in the comments. This entry was posted in Atheism, Quran Contradictions and tagged Allah, Atheism, atheist, Christianity, Christians, God, Islam, Jews, Judaism, Quran, Religion, the Quran. Bookmark the permalink. 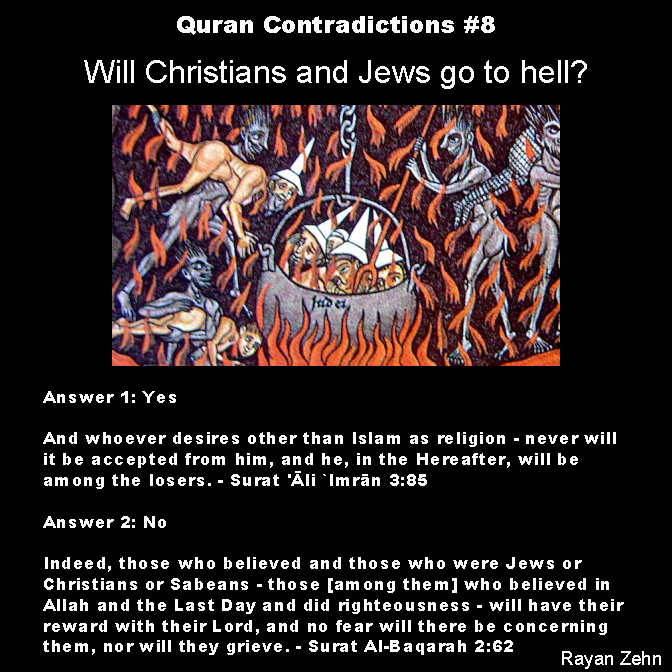 10 Responses to Quran Contradiction #8: Will Jews and Christians go to hell? OUR FATHER, WHO IS IN HEAVEN – Jesus taught that God is Spirit and Truth, Omnipresent, Omniscient and Omnipotent, who sees everything in secret and in secret rewards according to each one’s deeds. He taught that God is above any type of relativism, above time and places. The God mentioned in Our Father prayer, which is roman adulteration, anthropomorphic or external to everything and everybody, and slave of feigned clothing, idolatries, formulism and formalism, candles and other idolising and pagan trinkets, has never been the Sacred Origin that Jesus represented the best way he could. There is no sense of time and places for God, and He does not suffer any restrictions. He is in the deep inside of everything and everyone as EMANATING, SUSTAINING AND DESTINING DIVINE CENTRE, and no one will gain anything by saying the contrary because the ignorance, the error and the evil will be crushed at the right time. HALLOWED BE YOUR NAME – If God and His name depended on man’s sanctification He would be lost! Never would Jesus say such nonsense! This proposition is too stupid to deserve more attention. YOUR KINGDOM COME – It was the same Jesus who proclaimed that the Kingdom of God is inside each one, and it will not come with external signs. Everything depends on the internal blossoming of spirits. Besides, any fool is able to know that it is the spirit’s duty to march towards TRUTH, LOVE and VIRTUE, because there is no flaw in God and all, in principle, is for Him – Eternal, Perfect and Immutable. Those who got involved in being seller of pretences and idolatries are the ones who invented this clamorous mistake: for the kingdom of God to come, the fools need to buy nonsense, and bow before the sellers of nonsense, etc. Any Books and Prayers that teach to search God outside, far away, through simulations or lures are criminals. Waiting for God with open arms on top of mountains or not mountains is work of the ignorant or swindlers; it is the beginning of many mistakes, deviations, immorality, etc. God is OMNIPRESENT, and the communion between the child and the Divine Father is in the TEMPLE OF CONSCIENCE. YOUR WILL BE DONE – Never would Jesus teach such foolishness because He knew that the WILL OF GOD IS ABSOLUTE JUSTICE, which will be done whether everything that is relative, spirit or matter, wants it or not! To put the WILL OF GOD in terms of possible alternative, yes or no, is something that would never cross Jesus’ mind. Jesus had the Law of God as irrevocable; and his Divine Example of submission to the WILL OF GOD has never given place to any ambiguities. Whatever seems like that is man’s invention. ON EARTH AS IT IS IN HEAVEN – Again the dullness of subjecting God to places or time, etc! Again men’s foolishness, intending to subject God to their narrow-mindedness, to their restrictions and, above all, doing so to trade formalisms and idolatries with the fools! By affirming that God is far or in a territorial heaven, the owners of clergies become the mediators, or sellers of idolatries or superstitious nonsense. The other propositions are childish; and in God there is no forgiveness for sins, because the Divine Justice does not set precedents. Reequilibrium is acquired through deeds, that is why God offers opportunities, conditions and situations, etc. Let us not consider temptations from the part of God, but tests to be passed instead. It is not God’s job nor Christs’ or conscious spirits’ to pass the tests for whoever it may be. If someone KNOWS THE TRUTH AND PRACTISES THE GOOD, he will certainly get help for the success of his battles. God gives the elements but the achievement is up to the spirit. Understand clearly that the INNER temptation is always worse than the outer one. Therefore, no one should blame God or whoever it may be for their negligence or intentional wish to surrender to error. This is what Jesus taught, especially through His Divine Example. He did not put any responsibility on God, whose Fundamental Laws guarantee the relative free will to spirits. Do not forget that rights mean duties. And if it were not this way, God would be deaf or wrong or even evil, because Humanity is full of people who keep repeating the Our Father prayer all the time and commit crimes, from massive assassinations to the most depraved habits. This is what God wants: “Know yourself and reach fulfilment”! Your first quoted verse is absolutely right , it points towards kafir (disbelievers). The people who knew about Islam yet they don’t bother to research , and continue to do evil will go to hell . One thing is called “Ahl e Qitaab”. Allah says that Jesus , Mosses , Soloman and many others are Prophets of Allah. In Quran , it is mentioned that Allah revealed books on four prophets,Torah on Musa (Mosses), Injeel on Isa(Jesus), Zaboor on Dawood (David) and Quran on Mohammad . These four books were also revealed by Allah and its basic commands were same as Qur’an’s . But with passage of time , followers of these books changed the text but Quran , Allah has promised that he himself will take care of Quran . In the verse 2:62 , Allah is talking about Ahl e Qitaab , Christians and Jews who followed real Injeel (Bible) and Torah not the modern ones who don’t know anything but arrogance and ignorance . I agree, but Islam in this context refers to all the monotheist books sent down to man. In order to be a muslim one must believe in all the prophets (PBUT), the books and the oneness of Allah. The first quote is regarding disbelievers AFTER Muhammad, the latter is regarding disbelievers BEFORE him. I don’t understand what is confusing here. The verse clearly says “those who believed…” meaning before the time of prophet Muhammad peace be upon him the Jews and Christians and Sabians who believed in Allah and the last day and did righteous deeds will go to Paradise. Simple. Whoever disbelieves in Taghut and believes in Allah, then he has grasped the most trustworthy handhold that will never break. Further clear by this verse how to disbelieve in Taghut. 4:60 Have you seen those who claim that they believe in that which has been sent down to you(quran), and that which was sent down before you, and they wish to go for judgement (in their disputes) to the Taghut (false judges, etc.) while they have been ordered to disbelieve and reject them. But Shaitan (Satan) wishes to lead them far astray. I have learned a great deal from atheists. I have chosen to be a gnostic christian to simply sooth my soul and give me hope. Obviously, the organized religions are myths propagated by governments to harness control through taxation of the Citizens via the divine right to govern. I do not nor does mankind understand the concept of something coming from nothing. For both God and the Big Bang to have occurred, there had to be something already in existing or at least based on the physics we understand, something cannot just blow up from nothing and where did God come from. Let face it, mankind makes up the most plausible theories we can for such unknowns. So far it is the Big Bang theory and God that seem to be the most plausible. The fact is we don’t know if there was or is some higher power, alien force or entity that got us here. The miracle of life is the only type miracle I believe in. It is a miracle that we are here but we are really screwing it up. I have finally come to realize it is the nation-state that has been behind most of the lies and atrocities in history. Organized religion, faux science, slavery, taxation, wars, false incarcerations, the usurpation of our inalienable rights, etc. etc. etc. For some, the nation-state has become an organized religion, relying on social myths, lies, and propaganda. Islam is preceded by Jewish faith and Christianity and they’re all three parts of the same belief. So verse (3:85) meant any other religion except the religion of this One God of all three religions. Little knowledge is dangerous. So I insist that before you post anything read the entire chapter with historical context and understand the message without judgment. It is this little knowledge among Muslims, Christians and Jews that separated them. Islam was sent down upon stone worshippers to guide them to the same belief. But the Muslims went on to convert and fight Christians and Jews of which there was no need when Allah himself makes no distinction between us. It only served the political agenda of greedy and arrogant leaders.